In a large bowl, mix together the flour, sugar, bicarbonate of soda, cinnamon and salt. Make a well in the centre of the mix and pour in the eggs, oil, bananas and pineapple. Mix well and pour into cupcake cases. Bake in a pre-heated oven for 35 minutes or until a skewer inserted into the centre of the cake comes out clean. This colourful little jar contains all the magic of spring! It comes with different types of sprinkles, all prepped to decorate your bakes! From cupcakes to biscuits, from special occasions to casual cookery! The pot contains four types of sprinkles: colourful flowers, silver pearls, lilac pearls, and hite pearls. Add them on fondant, icing, sugar glue and more! Simply pop the top open and give the jar a shake to decorate your cakes! Ingredients: WHITE PEARLS [Sugar, Glucose Syrup, Colour (Titanium Dioxide), Glazing Agents (Shellac, Beeswax)], MULTICOLOURED FLOWERS [Sugar, Rice Flour, Cocoa Butter, Thickener (Tragacanth), Concentrates (Sweet Potato, Apple, Radish, Cherry), Colours (Riboflavin, Anthocyanins)], LILAC PEARLS [Dextrose, Sugar, Crisp Centre (Rice Flour, Salt), Glucose Syrup, Concentrates (Radish, Sweet Potato, Algae), Glazing Agent (Shellac), Colour (Titanium Dioxide), Flavouring, Acidity Regulator (Citric Acid)], PINK PEARLS [Sugar, Milk Chocolate (Sugar, Cocoa Butter, Dried Whole Milk, Cocoa Mass, Emulsifier (Soya Lecithin), Vanilla Extract), Crisp Centre (Rice Flour, Wheat Flour, Sugar, Malted Wheat, Wheat Gluten), Stabiliser (Arabic Gum), Colours (Titanium Dioxide, Carmine, Silver) Fish Gelatine, Glazing Agent (Shellac)]. Milk Chocolate contains: Cocoa solids 32% minimum. Energy 141 kcal, Fat 5.1g, of which saturates 3.1g. Carbohydrates 86g, of which sugars 86g. Fibre 0.6g. Protein 2.1g. Salt 0.1g. 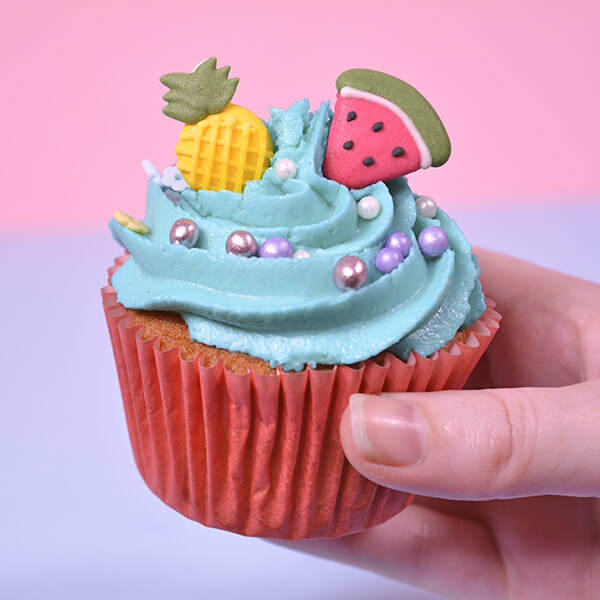 Brighten up your bakes with these tropical decorations by Cake Angels. 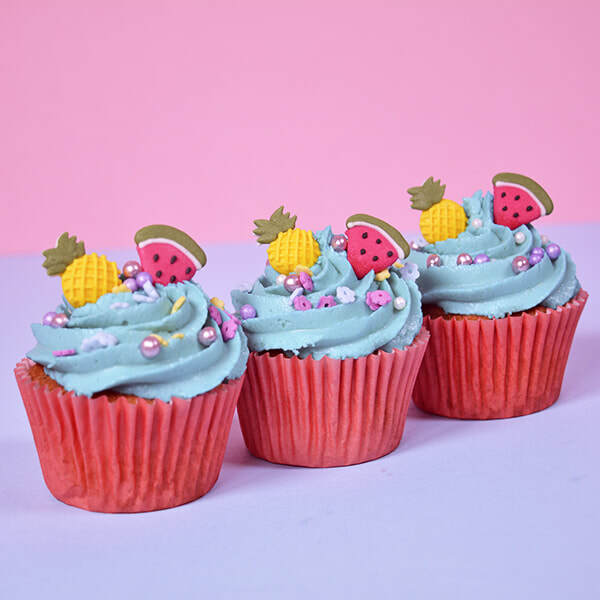 These edible decorations come includes 3 each of flamingos, pineapples, melons and hibiscus which really gives you amazing summer vibes! They are perfect for adding the finishing touch to special occasion cakes, ice cream, trifles, cookies and much more.